Bente Getz has returned to her family’s farm, situated high on a steep rake that rises almost vertically from the fjords of Samnanger, Norway. She left her homeland as a young woman to travel the world, a hippie who hopped around the globe, starting in the United States, then to Spain, and finally settling on a kibbutz in Israel, where she started and raised a family for more than a decade. It took her two years to rehabilitate her family’s abandoned property. But now that it’s back in shape, Getz raises cattle and sheep and farms her land according to simple organic practices. She produces cheese from her animals and sells them, along with dairy, at a small co-op in Samnanger. Bente Getz is just one of the many, interesting, generous, and talented people that I’ve had the great fortune of meeting through Friends of Lysverket, a collaborative dinner series and cross-cultural conversation hosted by Christopher Haatuft, the Norwegian chef of Lysverket in Bergen, Norway. I’m late in telling about this great project, which we started in 2014. I’d like to do so now. Last summer, Haatuft, whom I had met earlier in the year, called me. Inspired by that amazing tour that he had organized for me that March (which I wrote about in detail here) and the cross-cultural exchange it had spurred between the two of us, he wanted to expand our conversation to include a wider range of voices and talents. He found some sponsorship and proposed hosting a collaborative dinner series at his restaurant Lysverket in which we would invite a chef every two months to partake in a tour of the region, similar to the one Haatuft and I took, visiting artisans, craftsman, and other “friends” who contribute in some way to Lysverket. I would not only help by finding the guest chefs and facilitate a dialogue among them, but Haatuft also proposed hiring me to photograph the weekend-long events. I agreed to give it a go. Feeling our way through our first few conversations, we decided that, for each dinner, we would pick a general topic or area of interest we want to explore. Using that as a loose guide, Haatuft and his staff would build a two-day tour of their region and I would start brainstorming for chefs who I think would bring a unique perspective to the occasion. Norway’s seemingly infinite network of fjords, which stretches extensively inland, makes the country’s coastline one of its most striking features. Home to a mind-bogglingly vast ecosystem, the waters that surround Norway seemed like of infinite inspiration and possibilities. So, for the first dinner, Haatuft decided to focus on the water’s edge. I immediately thought of Justin Cogley, the chef of Aubergine at l’Auberge Carmel, who, for the past two years, has hosted an event that I’ve photographed called “Rediscovering Coastal Cuisine.” Since Cogley spends so much of his time cooking from the shoreline, and, more importantly, working with local entities — like the Monterey Bay Abalone Co. and the Monterey Bay Aquarium — to promote a sustainable, coastal ecosystem, Haatuft agreed that he’d be a natural fit for our inaugural dinner. So, Cogley came with me to Bergen in September of last year. We spent the first two days meeting with local artisans and food producers. We grazed our way through the Bergen Food Festival, which happened to coincide with that first Friends of Lysverket weekend. Among the many food stalls we visited, Haatuft introduced us to Knut Garshol, who specializes in making high-quality salt cod. Garshol showed us how he filets the dried carcasses, stripping off the leathery, dry skin in one, long tug. We met a woman who makes that caramel-like brunost, or “brown cheese” (a family to which geitost belongs), which is specific to Nordic culture. And, we encountered a number of unique, local baked goods – like skillingsbollen (think cinnamon rolls) and Hadanger kling (which I will talk about later). We discovered that Norwegians eat pancakes too. But perhaps more importantly, we learned that, although Norwegians may offer many condiments alongside their pancakes, it’s only socially acceptable to choose one (I mentioned this cultural maxim in my year-end round-up of desserts earlier this week). During that weekend, we also met with Arne Duinker (a marine biologist who I had met on my trip last March) and diver Knut Magnus Persson off the coast of Askøy, a nearby island, where Haatuft and Cogley donned wetsuits and snorkels and skimmed the surface for seaweed and other shallow aquatic life. Persson, being a pro, had far more lung power and was able to go much deeper. 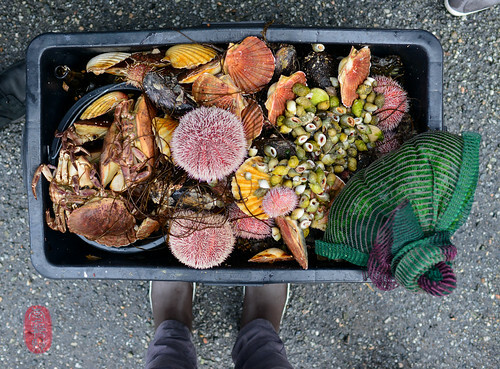 He disappeared for a disturbingly long period of time and surfaced hauling a bag sagging with treasures: scallops, cockles, a rainbow of seaweed, and crabs. Haatuft and I wanted to return to Øystese to introduce Cogley to Geir Henning Spilde, the apple grower who had delighted me with his amazing rainbow of single-varietal apple juices earlier in the year. We found him in the middle of pressing a batch of apples. The smell was incredible, a mix of perfumey fragrance and the acidity of cider. 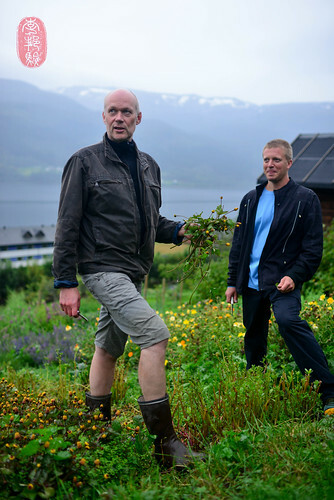 And we met Knut Finne, a farmer who grows an amazing variety of plants – herbs, vegetables, and fruits – on a sprawling field that tumbles towards the sea near Voss. We ended our tour at the Voss Bryggeri, where Jeanette Lillås and her husband Dag Jørgensen hosted us all for a tour of their small brewery, and let us participate in brewing a batch of beer. 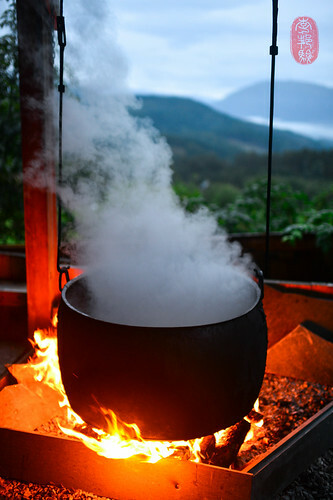 An enormous cauldron hung, boiling hops and steaming in the cool night, as Lillås walked us through their brewing process. Afterwards, we fell on a hearty stew that Lillås had prepared for us, with lots of beer on tap for all. 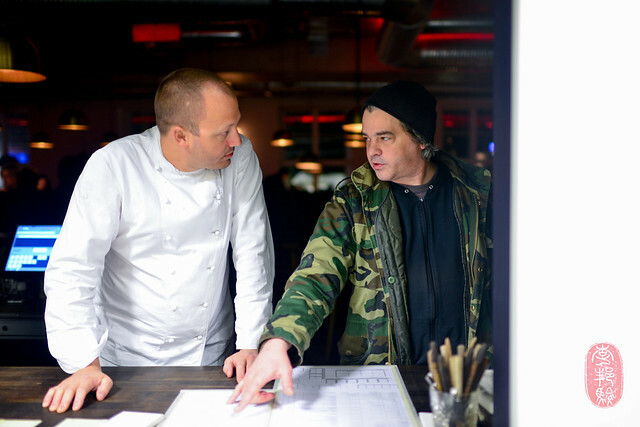 Having spent two days collecting ideas and ingredients, and cultivating relationships along the way, on the third day, Cogley and Haatuft cooked a dinner at Lysverket based on their dialogue and discoveries. They used the seafood that they, and Persson had found in Askøy, and paired a couple of the courses with beer from the Voss Bragger. At this dinner, Haatuft included the many voices and personalities that had made the dinner and the restaurant possible. Duinker and Persson came to the dinner, for example. 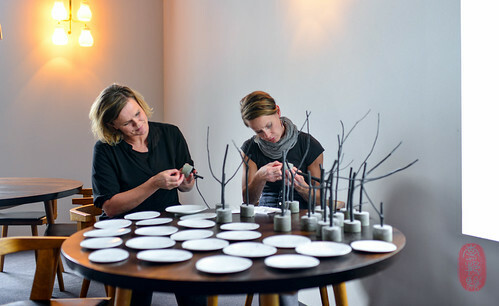 Haatuft also invited Constance Kristiansen and Tonje Sandberg, two designers who had left a large ceramic design firm to open their own, Odd Standard. Haatuft had worked with these two before, and wanted to include them in this event. Based in Stavanger, a city south of Bergen, Kristiansen and Sandberg were asked to create special service pieces just for this dinner. Their contribution turned out to be one of the most dynamic aspects of that weekend for me. Among the most memorable pieces by Odd Standard was a ceramic cone. Because it could not be set down without spilling its contents (Haatuft filled it with salt cod brandade), it forced an especially personal interaction between the servers and the guests, as the cone had to be handed from one person to another. Its shape also required diners to hold the cone while eating out of it. The designers were especially thoughtful in making the cones slightly oval. Not only did this fit the human grip more comfortably, but it also prevented the cones from rolling around when they were set down on a flat surface. As novel as these cones were, the highlight, for me, were the disposable plates that Kristiansen and Sandberg made for dessert. These plates were made from six, ultra-thin sheets of silk, which were laminated together with an edible glue made from powdered sugar. They were pressed to look like actual plates, with a wide ledge around the circumference. Because they were so thin, and because the sugary laminate was simply pressed and dried, any moisture put on the plate would not only begin to soften the silk, but also draw out the sugar in the laminate. Since, like most of the service pieces that Odd Standard created for this dinner, these plates had never been tested before, they posed two interesting issues: 1) If anything moist were to be served on these plates, then the dishes had to be quickly dispatched, before they wilted beyond use; and 2) since the plates would inevitably leach some sugar once food made contact, this required additional consideration in calibrating the sweetness of the food. It turns out that the plates held up surprisingly well to Cogley’s dessert: poached pears with brunost caramel, and Bente Getz’s dairy ice cream. They were sturdier than expected, and the amount of sugar they gave off was minimal. 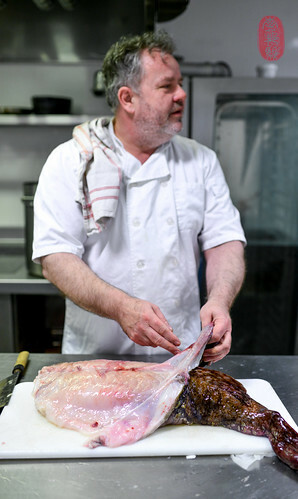 At The Sportsman, Harris serves really great lamb – he uses sheep that are grazed on nearby salt marshes. I’ve also had really nice game fowl and beef there too. But because the ocean practically laps at the restaurant’s door, Harris seems particularly keen on the flavors of the sea. Like Cogley, Harris walks the coastline, foraging what washes ashore. He also works with fisherman who bring their catch from deeper waters – bream, cod, ray (or skate), and sole, for example. Although Haatuft had planned a trip to go deep-sea fishing with Harris, inclement weather made that journey impossible. Sadly, we had to cancel it. So, in the spirit of Friends of Lysverket, Haatuft called up his friend Robin Oen, who runs the Dale Oen Experience, a non-profit organization dedicated to encouraging the young to explore the great outdoors. This organization is dedicated to the memory of Robin’s brother, Alexander Dale Oen, a champion Norwegian swimmer who died unexpectedly of a latent heart condition in 2012. Robin, who is an avid outdoorsmen himself, welcomed us to their sporting center, which is located on the water near the town of Øygarden. 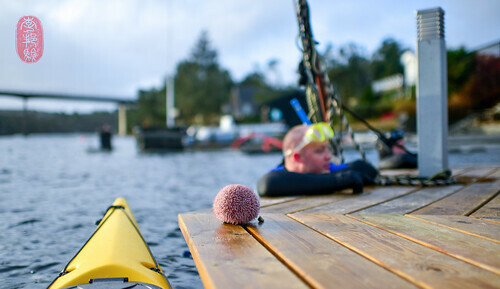 From his generous dock, we launched kayaks and motorboats into the cold Norwegian waters. Robin had baited some traps, and we hauled up the cages, with crabs clinging to the sides. As well, Haatuft and a few of his cooks put on wet suits and joined Robin in the water, diving for sea urchins in the shallow waters, which are especially clear and crisp. It was pitch-black when we pulled through Bente Getz’s gates in the late afternoon, after having been lost for a while in the maze of unmarked roads of the mountainous fjord lands. It was cold and rainy, which was not uncommon in this region, especially in November. Getz told us that it rains almost two-thirds of the year where she is, and due to the already shortened daylight hours during the colder months, the sun is an especially scarce friend in winter. Moving the party to her kitchen, we gathered around a large table and finished the night with a round of warm quiches that Getz had baked for us, which we washed down with her homemade beer. Beyond the people whom we met on our tour (Getz arrived at the dinner with fresh milk from her farm, which Harris used to make caramel ice cream for his dessert, a green apple soufflé), Haatuft also invited Eirik O. Skogen to the Harris dinner. Skogen works at Theodor Olsen, Norway’s oldest jewelry company, located just a few meters from Lysverket. He brought with him a stunning, sterling Viking ship, which collided Norse and Greek mythology by depicting the vessel borne on the riding waves of Poseidon’s posse. Stine Vikne, a local florist, used this silver ship as a vase and centerpiece for the dinner table, filling the hull with branches. 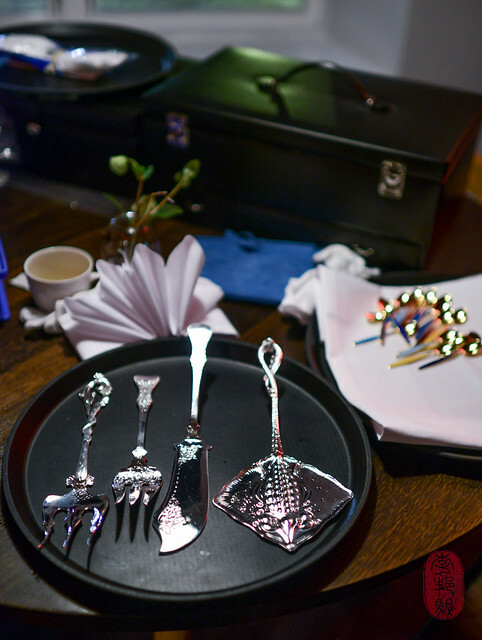 Skogen also brought with him culinary curios, like imaginatively forged serviceware (there was a fish spatula in the shape of a ray, for example) and a jaw-dropping trove of vintage, gold-plated flatware, which were used at this dinner. Contributing to this dinner, also, was Tara Garnell, a bartender and cocktail stylist from London. She was invited to the dinner by her former colleague Elias Vega (they worked for the same group of cocktail bars in London), who is now a bartender at Lysverket. Garnell worked with Haatuft and Harris to design a few cocktail pairings for some of the dishes. For example, she paired a sea lettuce-infused sake cocktail (which included a touch of dry vermouth) with a warm dashi broth that Harris poured into a small “rockpool” of mussels, oysters, and fish. The Friends of Lysverket dinner series, as you can see, is a largely unscripted affair, the result of spontaneous discussion and, sometimes, experimentation, rather than anything deeper, or more deliberate. 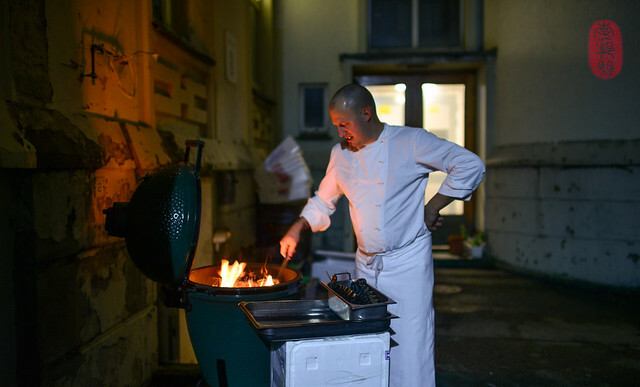 The purpose of these dinners is not for press or publicity – this blogpost is really the extent to which this dinner series has been openly discussed, especially outside of Bergen. And it’s not targeted for public consumption either, as there are only twelve seats available to the public at each dinner [the cost of dinner for these paying guests is 3,500NOK (approximately $460) per person], which is always held on a night when the restaurant is otherwise closed, adding to the familial feel of it all. Rather, having helped plan two of these dinners (with two more on the calendar), I can tell you that the Friends of Lysverket dinner series is, at its most basic level, a cross-cultural exchange between chefs, and on a broader (and my opinion, more significant) plane, it is a conversation among artists across a wide spectrum of crafts and industries (another, recurring contributor, for example, is Anti & Grandpeople, one of Norway’s leading design firms). These dinners are like one-off exhibitions, wherein a diverse group of moving parts (their mutual friendship with Lysverket being their one sure and shared link) are thrown together for a weekend to explore and figure out where and how they fit together. At the communal dinner table – which seats about twenty in total – these different voices are encouraged to share their stories and the parts they played in bringing these dinners together. I love this: I love the sense of adventure and community it fosters. I love the intimacy it creates. And I love the honesty of it. I am writing this post from Bergen, where it is currently 16.00, and the Lysverket kitchen is serving up some ribs and pork neck for family meal, with a variety of barbecue sauces I brought from Kansas City. Brooks Headley, the pastry chef at Del Posto in New York City, is in the kitchen busy brainstorming for the third Friends of Lysverket dinner that he’ll be cooking with Christopher Haatuft on Monday, January 19. 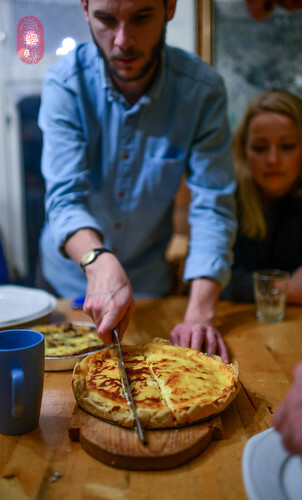 Tomorrow, Sunday, we are all heading to Hardanger to meet the Grøtt family at their bakery, Eikjetunet, where we will learn how to make traditional Norwegian breads, like lefse and krotakake. Nearby, we’ll also stop by Lars Kjetil Holdhus’s cabin where he salt-cures and hangs ham. Holdhus lives in Bergen, and he has been kind enough to offer to share his ham-making process with us. On Monday night, the Grøtts and Holdhus will attend this third Friends of Lysverket dinner, along with Gaahl, who was one of the leading artists of the second wave of Black Metal music and founding member of the Norwegian Black Metal band Golgoroth. Gaahl is a wine connoisseur and regular at Lysverket, and, given his musical background, Haatuft and his business partner Fredrik Saroea, lead vocalist and guitarist for the Norwegian electronic rock band Datarock, thought he’d be the perfect person to pair with Brooks Headley, who himself is a drummer and has toured with a number of punk and indie rock bands. I look forward to reporting more from this amazing, dynamic, and rainy corner of our world, as I watch the Friends of Lysverket circle grow. 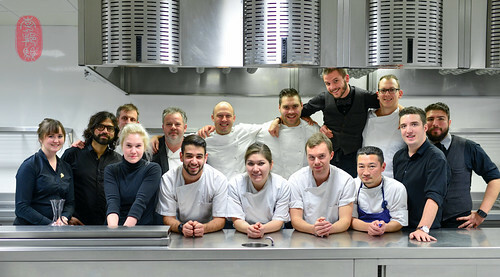 I will be returning in early March for the fourth Friends of Lysverket dinner, which will take place on Monday, March 9. We will be joined then by Roderick Sloan, the Scottish diver who has become well-known among Scandinavian chefs (and the culinary cognoscenti) for the amazing seafood he finds in the Arctic Circle, and a chef to be determined. You’ll find an album of photos from the first Friends of Lysverket dinner with Justin Cogley here. You’ll find an album of photos from the second Friends of Lysverket dinner with Stephen Harris here. Follow this album of photos over the next few days for photos from this third Friends of Lysverket dinner with Brooks Headley. 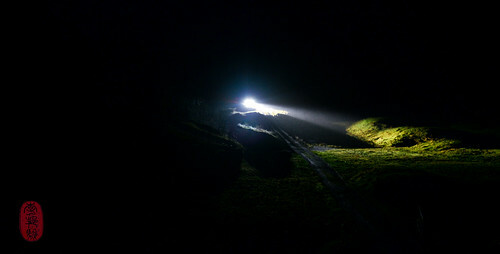 Photos: A lone set of headlights pierce the otherwise pitch-black night at Bente Getz’s farm in Samnanger, Norway; Knut Magnus Persson’s haul from the waters of Askøy, Norway; Justin Cogley and Christopher Haatuft suited up for a snorkel off the coast of Askøy, Norway; Knut Finne shows us his garden, with Justin Cogley, near Voss, Norway; a cauldron steams with brewing hops at the Voss Braggeri in Voss, Norway; Constance Kristiansen and Tonje Sandberg put finishing touches on their serviceware for the first Friends of Lysverket dinner in September of 2014 at Lysverket in Bergen, Norway; Stephen Harris dresses a monkfish tail at Lysverket in Bergen, Norway; a lone sea urchins sits on the dock, while Christopher Haatuft surfaces from the waters at the Dale Oen Experience near Øygarden, Norway; Stein Berge Berntsen; whimsical service ware from Theodor Olsen in Bergen, Norway; the Lysverket team after the second Friends of Lysverket dinner with Stephen Harris in Bergen, Norway; Christopher Haatuft and Brooks Headley discuss the menu for the third Friends of Lysverket dinner at Lysverket in Bergen, Norway; Christopher Haatuft grills lobsters on the Big Green Egg at Lysverket in Bergen, Norway. ~ by ulterior epicure on January 17, 2015.